Anorexia Nervosa is a kind of eating disorder wherein the person experiences an intense fear of increasing weight and causes restrictions on the amount of intake of food resulting in being dangerously thin. It can make a great impact on the body, damaging health resulting in mental illness wherein people between five to twenty percent who develop this disease eventually die of this ailment. Some people, who dread becoming fat or may feel unhappy with their looks, may be going through stressful moments on their eating habits at mealtime and thoughts about diet and intake of food tends to be the main issue on their mind. These thought tend to play a very dominant role in their mind leaving no time for family and other diversions to take their mind off from these thoughts leading them to lose weight and become extremely thin. Often people suffering from Anorexia may not be aware of this ailment and deny having this problem but the fact is that this ailment could be a serious, deadly, eating disorder though it has a remedy for recovery. People suffering from Anorexia weigh much less than a healthy or normal person and are afraid of gaining weight. They refuse to stay at a normal weight and think that they have gained weight even when they are comparatively thin. They are prone to controlling weight and diet, limiting themselves strictly to their eating habits with a tendency to exercise a lot even when they feel sick. With the help and support together with treatment one can break away from anorexia’s self destruction habit and lead a life of self confidence and good health. Experts have not really identified the cause of this problem but presume that eating disorders are complex and that it may be due to family history, personality traits or some social factors which could lead a person to this ailment. Some members in the family could have cultivated eating disorder or the person may have undergone some sort of body stress like modeling, ballet or even gymnastics, while other could have been going through stressful life events namely losing a dear one, divorce or moving to a new location, all of which could lead to Anorexia Nervosa. This ailment first affects the bones which develops during adolescence at the time when young people ignore the bone mass that sustains them through adulthood. This could cause much damage to the heart as the body loses muscle mass thereby losing heart muscle resulting in the heart getting smaller and weaker. It may tend to worsen in response to exercise; increased circulation, with the pulse and blood pressure getting lower with heart damages are some of the most common reasons for hospitalization for an Anorexia patient. An Anorexia patient gets restricted to severe calorie whereby the body does not get the required nutrients to function normally. They tend to starve themselves of the necessary nutrients needed by the body resulting in illness of mind and body which can affect the overall health of a person. 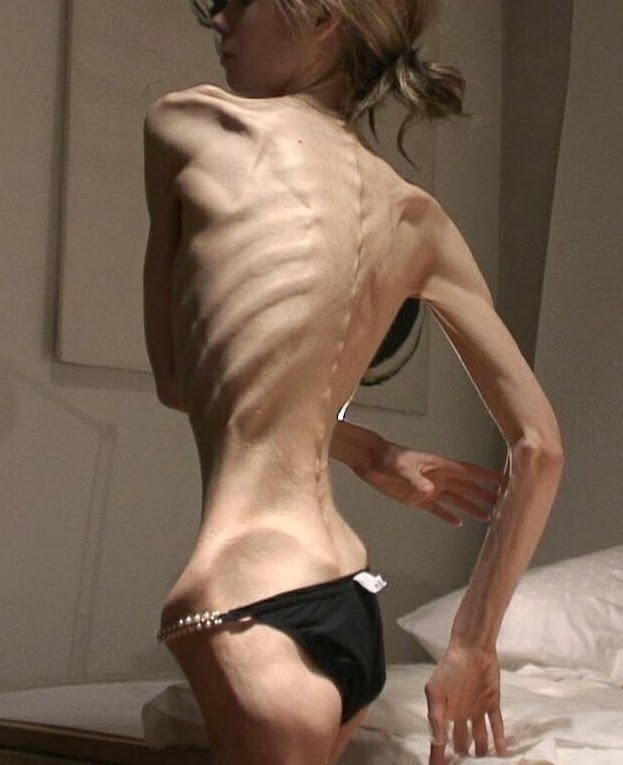 Effects of anorexia include lack of energy and weakness, severe mood swings, depression, poor memory and slow thinking, dizziness, fainting and headaches, growth of fine hair all over the body and face, constipation and bloating, tooth decay with gum damage, dry yellowish skin and brittle nails. Anorexia are of two types namely restricting type and purging type. In restricting type the person loses weight by avoiding calories through fasting, following strict diets with excessive exercising while in purging type, the person loses weight by using diuretics and laxatives or by vomiting. Individuals suffering from anorexia very often deny that they are suffering from this sickness and living with this ailment without any treatment can lead to serious problem as anorexia develops. The person becomes increasingly preoccupied with weight, their looks, conscious and careful on the food intake. They also tend to diet in spite of being thin or pretend to eat or are prone to lying about eating and get engaged in various way of avoiding high calorie food.